Thanks to Dr. Juan Segura Fonseca, Laboratorio de Patolog�a y Citolog�a Diagn�stica S.A. (Costa Rica), for contributing this case and the discussion. To contribute a Case of the Week, follow the guidelines on our Case of the Week page. Orchard� Pathology is an all-inclusive CP/AP diagnostic information system designed to accommodate the complex workflow and reporting of clinical, cytology, anatomic, and molecular testing. Orchard Pathology is used for AP only or as a single system that includes clinical and molecular�no more need for two separate systems. The shared database provides access to the patient�s history and enables the consolidation of clinical results to the pathology report. Unlike legacy text-based AP systems, Orchard Pathology stores report information in structured data fields that enhance EMR integration and simplify data mining for evaluations; correlation studies; quality assurance; and other management reports. (1) The topic search on the Home page now works for these chapters: Breast-nonmalignant, CD Markers CD1-CD49, Molecular Pathology and Skin-melanocytic tumors. We update the Topic search as we update each chapter. The Topic search looks for text within a topic's title (such as Langerhans cell histiocytosis or Medullary Carcinoma). In contrast, the Google Custom Search box searches our website for the occurrence of the search text anywhere on our website. This 44 year old female was initially seen at our outpatient clinic in 2005 for a skin "lump" near the dorsum and ankle of the left foot. There was no history of trauma and a local excision was done, revealing irregular, non-encapsulated, subcutaneous fibrofatty tissue. The diagnosis was soft tissue angiolipoma. Four years later, the lesion recurred (see images below). 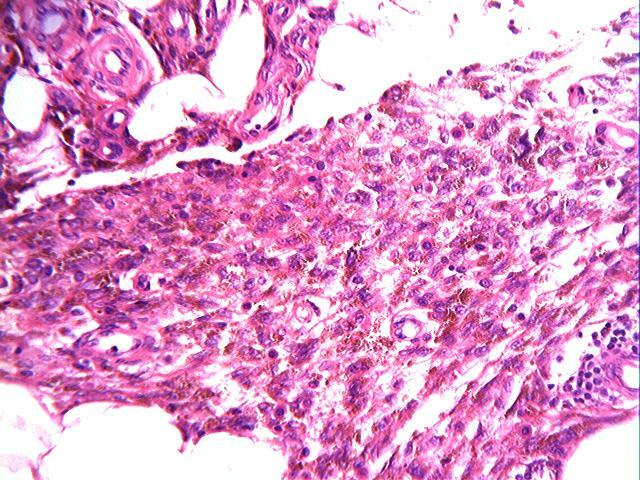 Microscopically, the lesion is characterized by two well defined tissue components, fatty tissue and spindle cells. 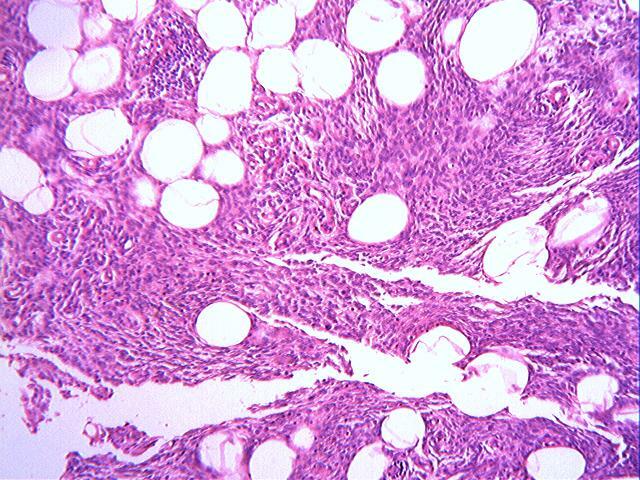 The spindle cells are arranged in a dissecting pattern between adipocytic lobules and along the septae (figs 1, 2). A minor focal inflammatory infiltrate is present (fig 3). 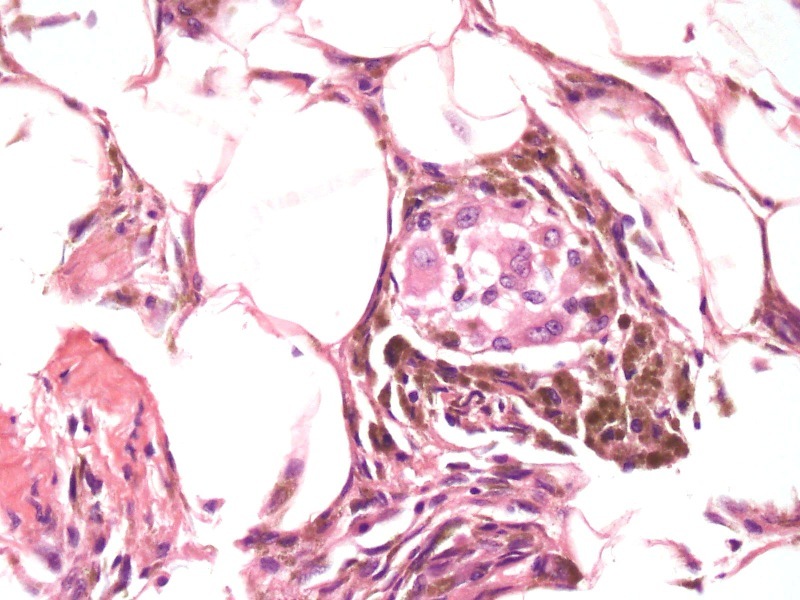 Abundant hemosiderin pigment is present in the cytoplasm of the spindle cells as well in numerous macrophages located around blood vessels (figs 4, 5). 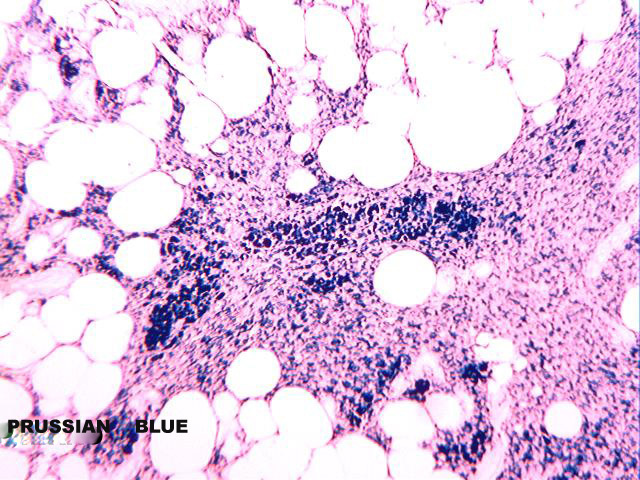 The pigment is positive for the Prussian blue iron stain (fig 7). Some small sized vessels are hyalinized (fig 6). 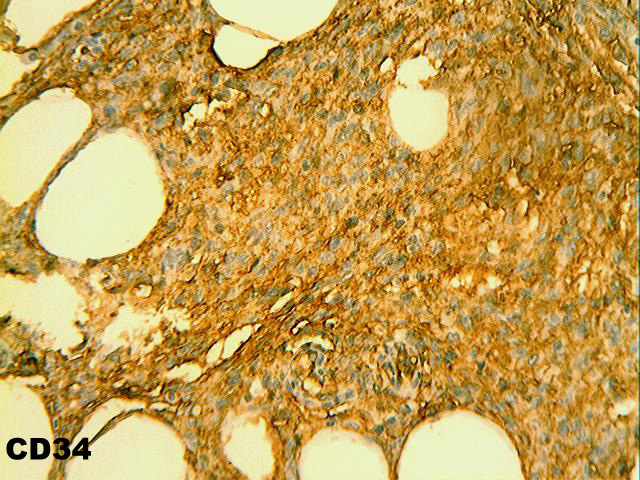 An SMA immunostain highlights prominent vessels (fig 8), but does not stain the spindled cells, which are strongly positive for CD34 (fig 9). Hemosiderotic fibrohistiocytic lipomatous tumor was first described by Marshall-Taylor and Fanburg-Smith (1). They described a peculiar soft tissue and subcutaneous lesion composed of CD34 positive fibroblastic cells, with a prominent vascularity and abundant hemosiderin within the cytoplasm of the spindle cells and many histiocytes. 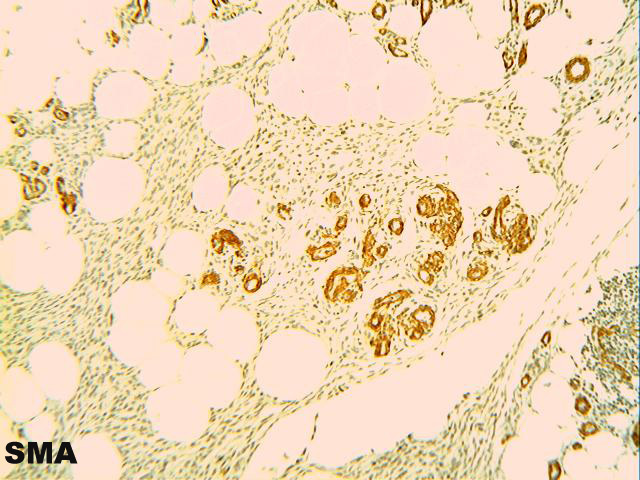 An associated lipomatous component was present. Eight patients were female and two were male. The mean age was 51 years. Almost all lesions were located in the foot, in the dorsum and around the ankle. Follow up in eight patients revealed local recurrences in four (50%) over a three year period. No patients developed metastatic disease. There was a history of local trauma in seven patients with ankle distortion and two of the women reported tight-fitting, uncomfortable shoes. Kazakov et. al. (2) reported two cases associated with venous stasis. 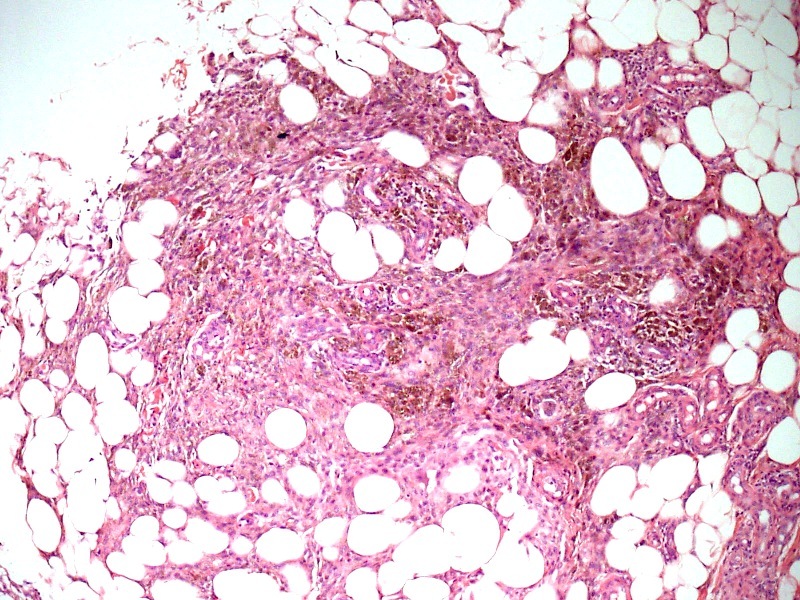 They hypothesized that the proliferation of the spindle fibroblastic cell component along with erythrocyte extravasation and formation of hemosiderin in the adipose tissue may simply represent an exaggerated tissue response to venous stasis. Browne and Fletcher (3) reported 13 new cases, and West et al (4) emphasized the clinical location in the foot, the unique histopathological pattern and described the MRI characteristics. Recently, Wettach et al (5) found a clonal reciprocal translocation between chromosomes 1 and 10, with a further chromosomal rearrangement in chromosomes 1 and 3, supporting a neoplastic and not reactive origin for this lesion. 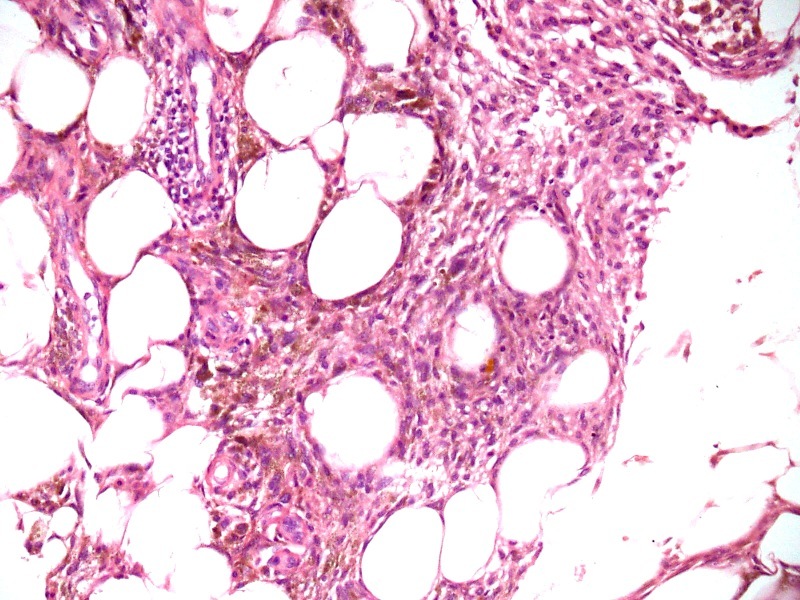 Hemosiderotic fibrohistiocytic lipomatous tumor is rare. In a recent review of the literature, Oliveira et al (6) found only 29 cases reported. All were biologically benign with no metastasis recorded. However, late local recurrences are frequent, and pathologists should be aware of this lesion (7). 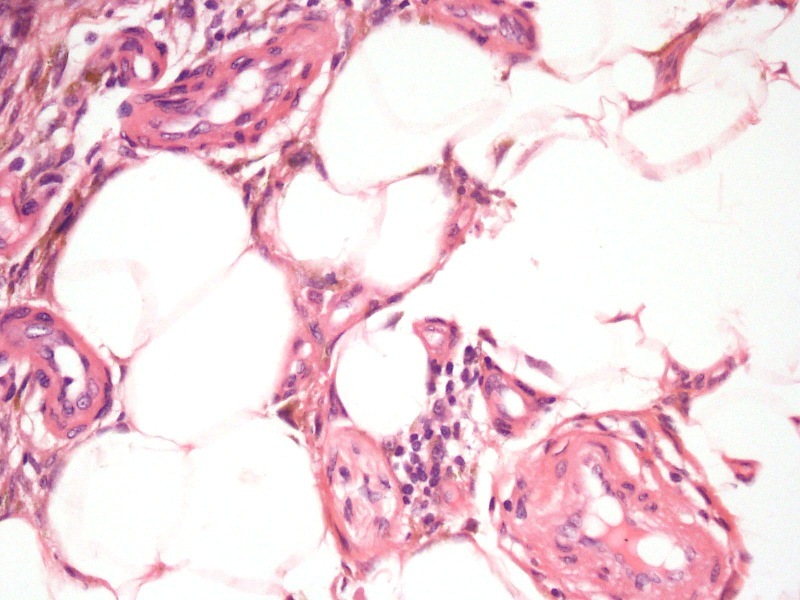 This lesion may be related to or represent a precursor lesion of the pleomorphic hyalinizing angiectatic tumor of soft tissue, due to its vascular hyalinization (8-10). The differential diagnosis includes several cutaneous and subcutaneous pigmented lesions of alleged fibrohistiocytic derivation: pigmented aneurysmal dermatofibroma (nodular, well localized storiform pattern), pigmented variant of dermatofibrosarcoma protuberans (called Bednar tumor, prominent cartwheel pattern, melanin pigment), Kaposi sarcoma-plaque stage (RBC extravasation, PAS positive globules, some HHV-8 nuclear positivity), and plexiform fibrous histiocytoma (mutinodular, storiform pattern, numerous multinucleated giant cells, scanty hemosiderin). 1. Marshall-Taylor C, Fanburg.- Smith JC. Hemosiderotic fibrohistiocytic lipomatous lesion: Ten cases of a previously undescribed fatty lesion of the foot / ankle. Mod Pathol 2000;13:1192.